These fun, beginner snowshoes are hugely popular with kids because they're shaped like a bear paw and leave "monster paw prints in the snow"....or in the summer, in sand. 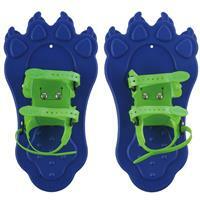 This lightweight design makes it easy for youngsters to trek along, especially with SnowPaws easy-on, easy-off bindings. These little snowshoes are a great way to enjoy the outdoors with your kids, get them out of the house, and enjoy winter backyard fun like never before. 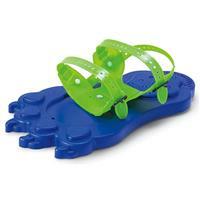 Fun for romping and stomping tikes - makes bear tracks in the snow. Perfect for snow, sand or dirt. 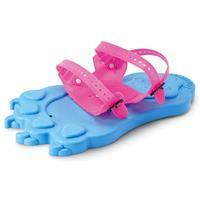 Easy on, easy-off binding fits a wide range of footwear up to kids size 1. Hinged bindings for easy steps. Designed for kids ages 3 to 7. Not intended for true snowshoeing experience, this item is to be considered a toy. Bindings: Flexible and secure binding that snugs up and features lateral support, adjustable toe, mid-section and heel straps. This is such an inexpensive way to see so many smiles to come from your little one! Easy to put on your kiddos feet. You can use these in not only snow but sand as well. He/She will feel like a bear tromping around smiling ear to ear!